The Brubacher house was built in 1851 by John E. Brubacher and his wife, Magdalena (Musselman). The grand field stone house was built in the typical Mennonite style of the time and the Brubacher raised all of their 14 children there. 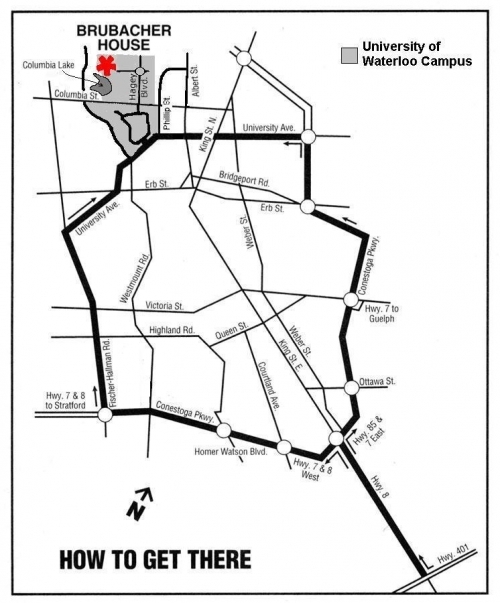 The property was purchased by the University of Waterloo in 1965. The idea to restore one of the Mennonite farmhouses on the University of Waterloo campus originated with the Mennonite Historical Society of Ontario and the Environmental Studies faculty at the university. These parties argued that the preservation of a Mennonite farmhouse would act as a reminder that the modern UW campus was once owned by Mennonites and the land was used for agriculture. The proposal to restore a Mennonite farmhouse was accepted by the University of Waterloo administration and the Brubacher house was selected as an appropriate candidate for restoration. Unfortunately, the old stone house caught fire in 1968 and was gutted, just months before work was to begin on renovations. Simeon Martin, a Mennonite carpenter took on the project of crafting new timbers for the Brubacher house. Enough beams for the entire house and interior framing were hewed by hand from donated wood. The house also was in need of a new roof and enclosed windows were installed to prevent damage to the contents of the house due to climate changes. The Brubacher house building and surrounding property is currently owned by the University of Waterloo. The Mennonite Historical Society of Ontario was asked to take over the responsbility of furnishing the main floor of the Brubacher House. Lorna Bergey, long-term secretary of the Mennonite Historical Society of Ontario, coordinated the gathering of furnishings for Brubacher House. The furnishings reflect the typical style of a nineteenth century Mennonite farmhouse. Most of the furniture has been donated by Mennonite families in the Waterloo region and the pieces are authentic. The Brubacher House is a natural learning centre and tours are available during the summer months. A conference room is part of the main floor of the house to accommodate larger groups. Tours are also available by appointment at other times throughout the year.